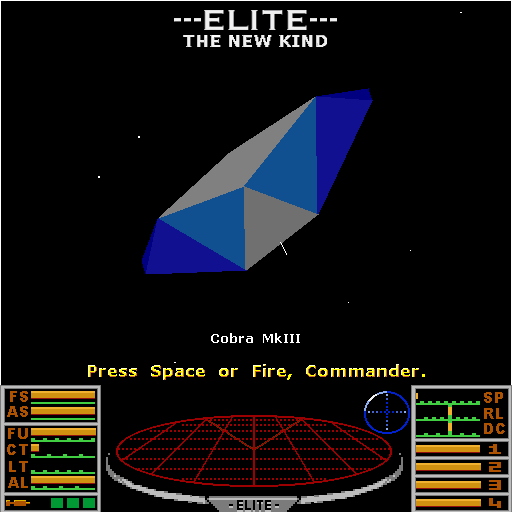 I spent many hours playing Elite on the Commodore-64 and I was glad to experience it again when I discovered "Elite, The New Kind" by Christian Pinder. The version I obtained was written for the PC using djgpp and allegro, but the build still works on my Windows 8.1 desktop machine. I have not been able to locate a link to download this version, but a later version is currently available at Ian Bell's web-site. No source code is included with the "Final" version, but it appears that this version, 1.1, was written using the SDL graphics library instead of allegro. On Ian Bell's "Elite 30" page you can find a link to an online version to play in your browser. If you want to experience the true 1980's computer gaming experience with wire frame graphics, try this one.